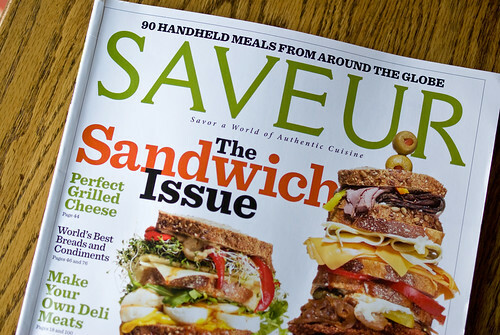 Being a complete sucker for a good sandwich (as you can see by the photo selection above – gee, that’s a lot of sandwiches), I was thrilled to see the new Saveur arrive in the mail with “The Sandwich Issue” blazoned across the cover. Woohoo! After perusing it from cover to cover, though, I was shocked to see two of my favorites, the chicken salad and the egg salad sandwich, very underrepresented. I found two recipes for chicken salad, but both are the kind I loathe, with grapes and nuts and celery, or currants and curry powder. Ugh. 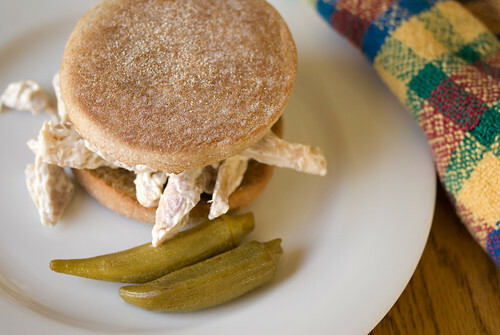 Personally I find it hard to do better than chicken salad in its simplest form: cold roasted shredded chicken mixed with Best Foods mayo (neither Miracle Whip nor homemade mayonnaise will do). I roast chickens just so I can have this for lunch the next day. I might put lettuce on, or green chutney, or a slice of piquillo pepper if I have one, but more often than not I’ll eat it plain, preferably on a toasted whole wheat English muffin. 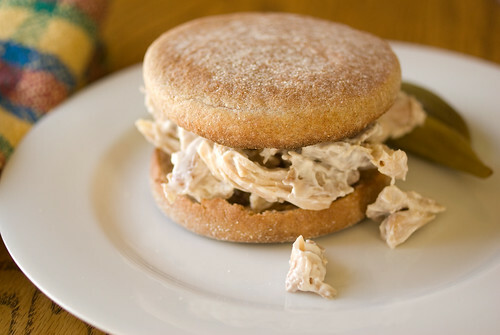 Despite my love for more elaborate concoctions, this is really my perfect sandwich. The proper accompaniments are beer or iced tea, and a good helping of pickled okra, or perhaps dilly beans. Lunch just doesn’t get much better than this. What’s wrong with simplicity? It combines chicken and bacon. Need I say more? Why would you add bacon to a chicken salad? I like bacon just fine, but it doesn’t belong on everything. 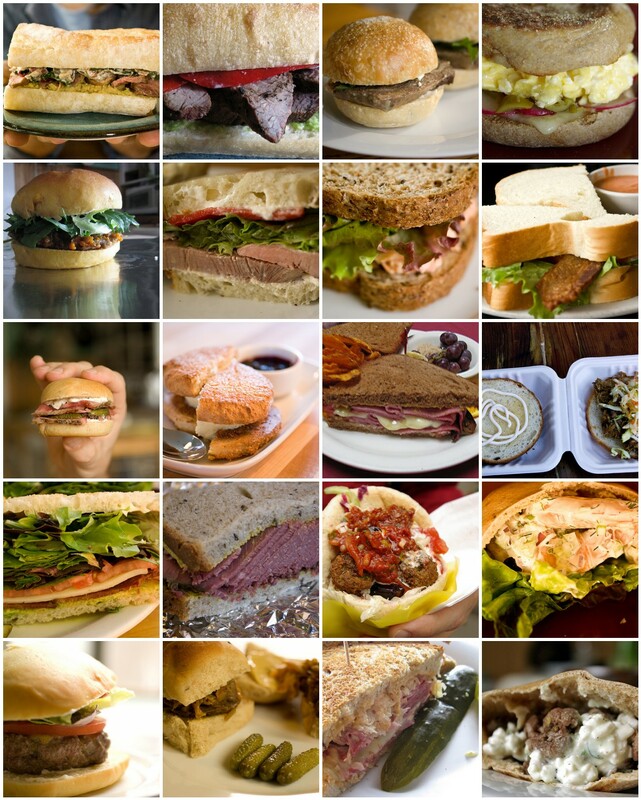 A BLT? Sure! Chicken salad? I dunno. I’ll take mine plain. Pickled okra!!! I don’t think I’ve seen that before. Do you pickle it yourself or purchase it? Pickled okra is one of my all-time favorites! It’s a southern USA thing, we first had it in a Cajun restaurant in Seattle, where there were huge crocks of it on every table. The texture is fabulously crunchy, especially the seeds. We can’t grow okra in our climate, so the only way I can usually buy it is frozen in chunks, which works for Indian curries but not for this. There’s a brand of pickled okra from Texas that we can buy (we get the hot version), but if I could get it fresh I’d definitely try pickling it myself.